Lightning Powder's AccuTrans Tube contains the ultimate in dual-stage casting material (also known as "forensic sil" or "forensic silicone"). It is ideal for casting prints and tool marks in tricky places. AccuTrans is also DNA-friendly. No mixing is required thanks to the two-tube design: One tube is the casting material and the other the catalyst, so it remain inert until used with a proper dispensing device (sold separately). You'll also save money by avoiding waste since you can dispense exactly the amount you need. The rest stays unused - and ready to be used - in the tubes. It is available in three colors - clear, white and brown - to make certain you get the best contrast. The non-toxic polyvinylsiloxane material is resistant to tearing, highly flexible and cures in less than five minutes at 68°F (25°C). This makes it great for creating permanent, smear-proof casts. 75 ml tube of AccuTrans (a.k.a. 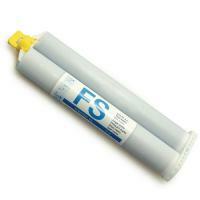 forensic sil or forensic silicone). Two-tube design. Does not require mixing. Resistant to tearing or smudging. Cures in approxaimtely four minutes.